If you have loved the story of Peter Pan since childhood, it’s only natural to love the musical Finding Neverland as well. The national tour of Finding Neverland, which closes at the Orpheum Theatre today, is sparkling, whimsical, and fantasy-filled. To say that the show sparkles is not hyperbole: sparkling fairy dust flows freely through the scenes, sometimes filling the stage with an incredible lighting effect. The appearance of fairy dust symbolizes how the life of J.M Barrie, the main character, intersects with his fantasy of a far-off land and a boy that flies – Peter Pan. 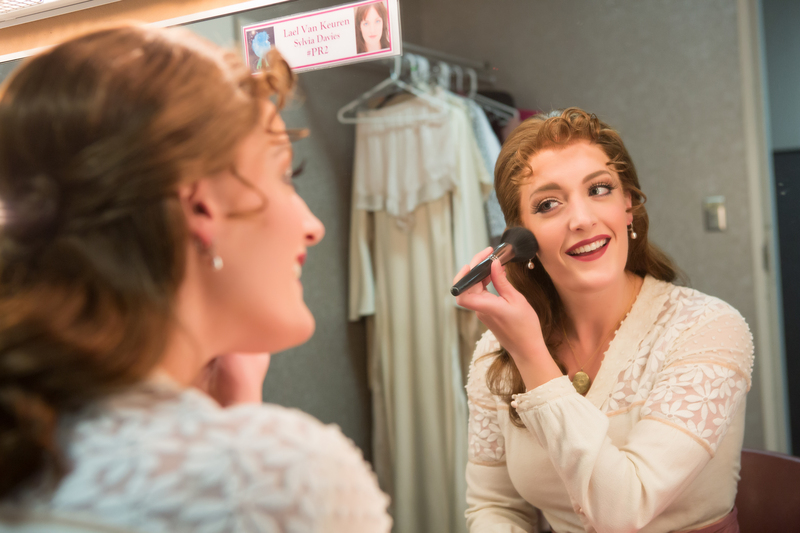 Read Basil Considine’s preview of the musical. The production, designed by Scott Park and directed by Diane Paulus, is marvelously colorful. It also has a scrumptious pop musical score by Gary Barlow and Eliot Kennedy, and great performers – some quite young. Beautiful costumes by Suttirat Anne Larlarb and snappy choreography by Mia Michaels fill out the dioramas of J.M. Barrie’s life in London. Scenes of upper-class Londoners play out in the park with parasols, actors rehearse on a West End stage, and the action visits the interior of an English pub. Much later, the bedroom of the Davies boys is instantly recognizable as the bedroom of Wendy and her brothers, with a large centrally located window that opens out into the night air. In Act I, Barrie meets a group of boys playing in the park. One boy named Peter who would rather sit by himself and read, however; Barrie finds out that their father had recently died. It is at this point that he first meets their mother, Sylvia Davies. He finds himself attracted to the boys’ lovely young mother, while at the same time he discovers his wife seriously coming on to a wealthy English lord. Billy Harrigan Tighe plays Barrie as a fish-out-of-water. We are told his latest play flopped and he then writes a play about a fantastic place called Neverland. The people around Barrie are taken aback by his rebelliousness. He insists that an ensemble of skeptical actors bring his play to life and present it to the upper-crust of London. His eccentric behavior runs smack into popular opinion: Barrie realizes that most adults think him unlikely to be successful, to say the least. appears out of Barrie’s imagination. Davidson mugs with insatiable bravado and steals the scene with a charisma that is a hilarious contrast to Tighe’s portrayal of Barrie’s milquetoast personality. It is perhaps surprising that Barrie relates more to the pirate rather than to Peter Pan. Peter Pan himself (or herself, if you consider the actress, Dee Tomasetta, who portrays him) appears only around the fringes of the play so as to not detract from the young boy Peter who inspired Barrie in real life. Hook takes full advantage of this substitution by taking center stage. The most innovative and exciting part of the play arises out of the song “Circus of Your Mind”, which takes the audience through four scenes with a continuous flow of music, movement, and multimedia. It is at this point in the performance that we see influences reminiscent of Stomp, with dancers pounding the stage with poles. In a surrealistic manner, doors float across the space, allowing Barrie to go from scene to scene as if in a dream sequence. A monstrous projection by Jon Driscoll of meshing Victorian-era mechanical gears creates an expressionistic sense of ominousness. Actress Lael van Keuren (Sylvia Davies) getting ready backstage. Photo by Jeremy Daniel. Lael Van Keuren plays Barrie’s love interest Sylvia Davies and sings the song “All That Matters” wonderfully. However, the romance between the two characters seems more like a sentimental illustration than the felt portrayal of a life-altering romance. It is here that the play falters, despite its great songs. The play also takes a wrong turn in Act II when we see the real-life Peter (played by several different young actors) and his three brothers in their backyard. They set up their own theatre with curtains on a clothesline. The scene is earnestly done and the Sesame Street-like song “We’re All Made of Stars” is catchy, but is ultimately distracting and looks as if it is from another play entirely. The defining scene of the play finds the ensemble of actors for the Neverland play-within-a-play in a pub, drinking and commiserating about the humiliation of having to perform a play written for children. The scene features “Play”, the most fun song of the play, with the character’s gradually become inebriated. The song is rendered with humorous aplomb by Jon Davidson, this time playing the theatre manager Charles Frohman. On a more serious note, the special effects continue to dazzle in the production’s eleventh hour. The death of Sylvia (not a spoiler) is represented with her passing through Wendy’s window while a swirling vortex of sparkling fairy dust surrounds her, with stage illusions by Paul Kieve and air sculptures by Daniel Wurtzel. The tornado-shaped cloud of sparkles hangs in mid-air, lit by strobing LEDs and supported by special fans in the stage floor. As she exits, Sylvia’s scarf remains swirling in the vortex of sparkles for several more minutes. The visual result is a kind of performance art that rivals showcase displays at the Walker Art Center. 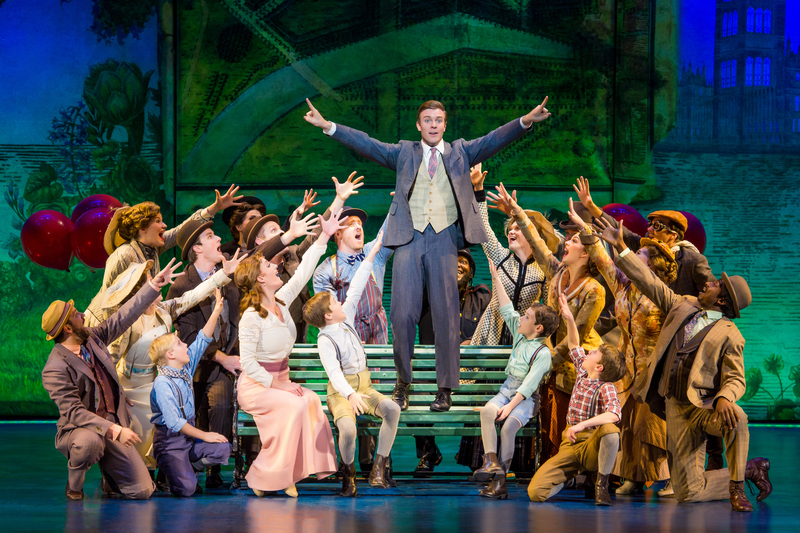 Finding Neverland is light but entertaining, unless you insist that your be overtly thought-provoking. 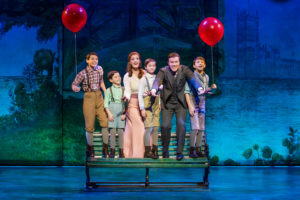 It is a sophisticated musical with technologically innovative effects, but a bit reliant on viewers’ advance knowledge of Peter Pan.